Trust, love, faithfulness and happiness. The gemstone for July is the ruby, which is highly prized and greatly increases in value with size, as the larger varieties are very rare. Rubies, like their family member the sapphire, are formed of the mineral corundum. Every other color of this mineral are called sapphires, only the red variety are rubies. As they increase in size these stones become even more rare than the larger diamonds and sapphires, making them a hot commodity and highly sought out. Far to the east, this stone was believed to contain the essence of light and life itself. They said that the stone appeared to be lit from within and referred to it as “the lamp” or the “glowing stone”. Ancient Hindu priests believed that rubies and emeralds used their fire to light the chambers of the gods. They also regarded sapphires as being a ruby that had not yet ripened; they would often bury them and wait for them to mature. It has often been said throughout the centuries that a ruby could foretell bad fortune. It was thought that the stone would turn darker if there was a threat to the wearer, or if they were sick. They say that the first wife of King Henry VIII predicted her own demise with the darkening of her ruby. Today the ruby is the traditional birthstone of July, and is often given on Valentine’s Day, as well as anniversaries as a declaration of love. For a ruby, the rarest are the brightest and exhibit a color like a fire hydrant. 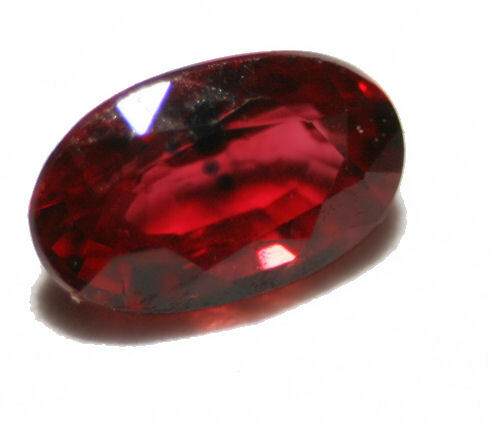 If you have a ruby with a star pattern that is set in a fire red stone you have a very fine specimen. Even more rarely, there are twelve point stars found, but the value of the stone does not depend on the star, rather the color of the gem itself. The dictionary.com definition of Ruby is “a red variety corundum, used as a gem”. The word Ruby comes from Middle English ‘Rubi‘ c1300. which has origins in the Medieval Latin ‘Rubīnus’. This originates from the Latin ‘Ruber’, meaning red. Ruby is a variety of corundum which has a deep red color due to traces of chromium contained within it. Corundum is also known as aluminum oxide. Ruby or aluminum oxide with chromium has the formula Al2O3:Cr. It’s crystal system is trigonal, specifically hexagonal scalenohedral, with a crystal habit of terminated tabular hexagonal prisms. Ruby is a very hard mineral with a hardness of 9 on Mohs scale (diamond is 10). It has some transparency with a vitreous luster. It’s specific gravity is 4.0 and it has a melting point of 2044°C. There are three methods for making synthetic rubies: hydrothermal, flux growth process, and a pulling process. These manmade rubies have purposes other than just jewelry however, they can be used to make things like lasers.